Visa Inc (V) , is a payments technology company that operates a payments network worldwide. The company facilitates commerce through the transfer of value and information among financial institutions, merchants, consumers, businesses, and government entities. The company just raised its quarterly dividend by 17.80% to 16.50 cents/share. 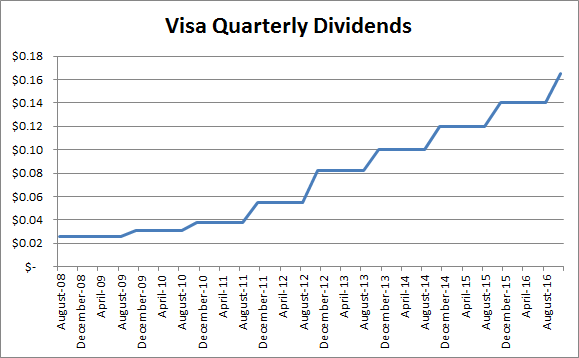 This is the eight consecutive annual dividend increase for Visa. Given the rapid growth in earnings per share, and the low dividend payout ratio, I am more than confident that Visa will become a dividend achiever by 2018. Visa is a perfect example of the trade-off between dividend yield and dividend growth. The stock has never yielded more than 1%, which has deterred many investors from putting money in its stock. The high earnings and dividends growth have more than compensated investors, resulting in strong total returns and with high yields on costs. Despite the fact that it had only raised dividends for a few years, I broke my rules to invest in the company, because I believed in its future and the valuation was fair. The stock is overvalued at 29.50 times forward earnings and yields 0.80%. If a stock market correction leaves to a drop in Visa stock below $56/share, this may provide with a good opportunity to purchase a world class dividend growth stock at fair valuations. Alternatively, if earnings estimates increase, the amount I am willing to pay for the stock would increase correspondingly (at the maximum rate of 20 times earnings). My position has been built in 2011 and 2014/2015 when the stock was selling around 20 times forward earnings on each occasion. Magellan Midstream Partners, L.P. (MMP) engages in the transportation, storage, and distribution of refined petroleum products and crude oil in the United States. It operates through Refined Products, Crude Oil, and Marine Storage segments. This master limited partnership raised its quarterly distribution to 83.75 cents/unit. This represents a 9.80% increase over the distribution paid at the same time last year. Magellan Midstream Partners has rewarded limited partners with a distribution hike for years in a row. 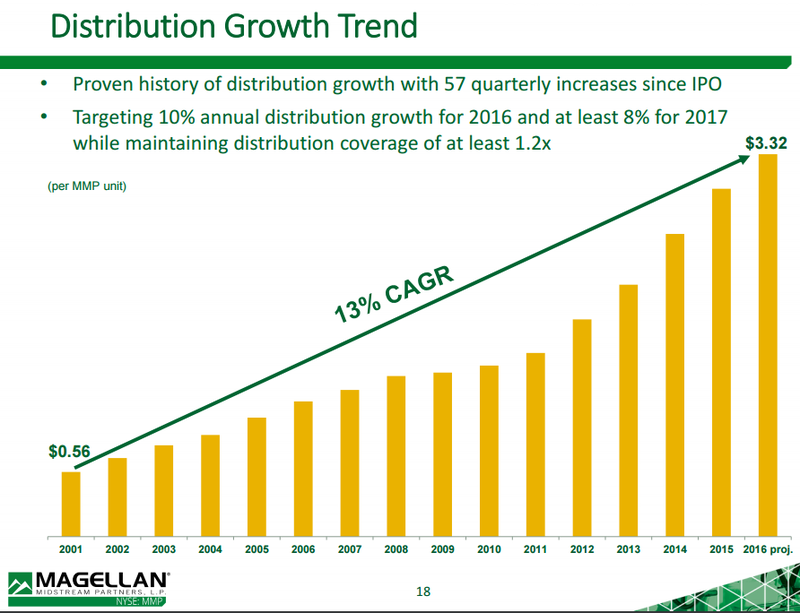 Over the past decade, Magellan Midstream Partners has managed to raise dividends at a rate of 11.50 %/year. Cintas Corporation (CTAS) provides corporate identity uniforms and related business services primarily in North America, Latin America, Europe, and Asia. The company raised its quarterly dividend by 26.70% to $1.33/share. This marked the 34th consecutive annual dividend increase for this dividend champion. Over the past decade, Cintas has managed to raise dividends at a rate of 12.60 %/year. The stock is overvalued at 23.10 times forward earnings and yields 1.20%. The stock may be worth a second look on dips below $92/share. Lincoln Electric Holdings, Inc. (LECO), through its subsidiaries, designs, manufactures, and sells welding, cutting, and brazing products in the United States, China, and Internationally. The company raised its quarterly dividend by 9.40% to 35 cents/share. This marked the 22nd consecutive annual dividend increase for this dividend contender. Over the past decade, Lincoln Electric Holdings has managed to raise dividends at a rate of12.40 %/year. The stock is overvalued at 20.60 times forward earnings and yields 2.30%. The stock may be worth a second look on dips below $65/share. Stepan Company (SCL), together with its subsidiaries, produces and sells specialty and intermediate chemicals to manufacturers for use in various end products worldwide. It operates in three segments: Surfactants, Polymers, and Specialty Products. The company raised its quarterly dividend by 7.90% to 20.50 cents/share. This marked the 49th consecutive annual dividend increase for this dividend champion. Over the past decade, Stepan Company has managed to raise dividends at a rate of 6.40 %/year. The stock seems fairly valued at 16.80 times forward earnings and yields 1.10%. I will put the company on my list for further research. TransMontaigne Partners L.P. (TLP) provides integrated terminaling, storage, transportation, and related services. This master limited partnership raised its quarterly distribution to 70 cents/unit. This represents a 5.30% increase over the distribution paid at the same time last year. TransMontaigne Partners has rewarded limited partners with a distribution hike for 12 years in a row. Over the past decade, TransMontaigne Partners has managed to raise dividends at a rate of 5 %/year.